A report published today on the controversial welfare reform bill, reveals Parliament may only have been told the partial truth about the overwhelming opposition to the government’s consultation on the planned changes to the Disability Living Allowance (DLA). The report, based on data obtained through Freedom of Information requests, was written by Sue Marsh, author of the Diary of the Benefit Scrounger blog. It was researched and funded by thousands of sick and disabled people, who are about to be affected by the cuts to their benefits. With only two days to go until the House of Lords votes on the bill, the group plans to campaign on Twitter as well and hope to get their hashtag #spartacusreport trending this morning. 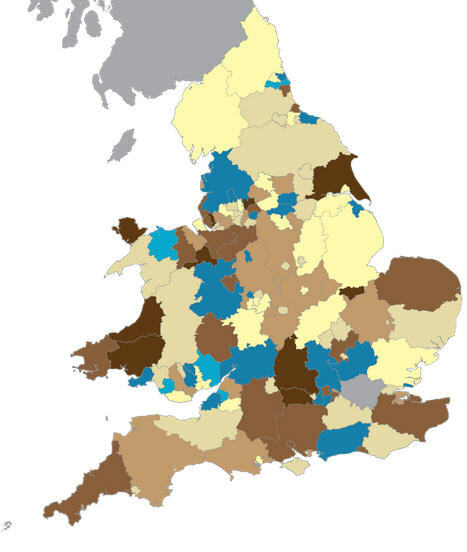 Cuts to disability benefits: how is your local authority coping? As part of its austerity measures, the British government is making cuts on several welfare benefits. One of the affected groups is Britain’s 10 million disable people (figures provided by the Disabled Living Foundation). How serious is the situation in your local area? The independent think tank Demos, has mapped out their research data in the area, which allows us to check how well (or badly) each local authority in England and Wales is coping with the budget cuts to disability services. They were ranked as very good, good, well, ok, poor, bad or very bad. The methodology Demos used to analyse the data and produce a nationwide picture is explained here. Testimonials compiled on the False Economy site by people affected by the government cuts try to give voice to the current crisis, but more needs to be done. The Where’s the Benefit campaign put out a call for disabled people in the UK to join their local “Occupy” groups for a couple of hours every Sunday afternoon and raise awareness on how the welfare reform bill and its proposed cuts are affecting them. WtB also compiled, in a podcast, stories about the role the Disability Living Allowance (DLA) plays in a disabled person’s life (#myDLA hashtag on Twitter). In our previous post, Paul Bradshaw wrote about the Department of Work and Pensions’ press release claiming disability benefits were paid “without checks”. The press release triggered several media articles, but published DWP figures were interpreted widely differently on The Daily Mail and The Telegraph. The discrepancy was unpicked on the Left Foot Forward blog. Have you or a loved one, been affected by cuts to disability benefits? Does the Demos map inspire you to collaborate with an investigation in this area? Would you like to ask Help Me Investigate Welfare to investigate any specific issues/facts/figures? Do you know someone who is already doing that and would like to introduce us to them? Are you good with video cameras and would like to get some live interviews with disabled people joining Occupy on Sundays? You do not need to be a journalist or researcher in order to help; we will give you guidance and tips. Leave a comment, get in touch. “The rest of the release paints a more complex (or to be less diplomatic, potentially contradictory) picture. “It seems 42% of claimants had a statement from their GP verifying their medical condition; a further 36% submitted other sources of evidence, a category that can include reports by social workers or occupational therapists. “Surely a GP is a “healthcare professional”? And surely all these trained staff will have met the claimant in person? Does this not count as a form of assessment? Apparently not. Also debunked and unpicked on Left Foot Forward.